Join us every Friday for our 40-yard sharp shooting competition. – Hit a playing card from 40 yards to qualify for the semi-finals at the end of March. – Iron sights, 8 shots, 9mm and above. 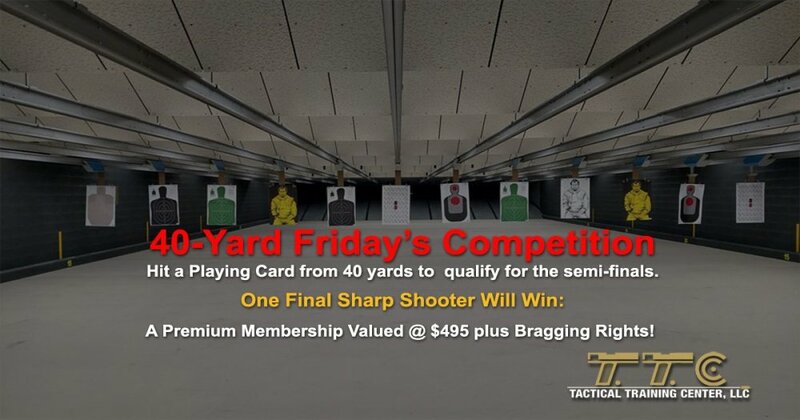 – One Final sharp-shooter will win a Premium Membership valued at $495 and have Bragging Rights! Semi-finals will be held at the end of March. Stop by the TTC range and take your shot! Classic - 6 shot speedloader guns, Iron sights. ICORE Board of Directors North East Region. Rifles are sold with 2-position lowers, NOT the 3-position Full Auto shown in the photos! Join us for National Shooting Sports Foundation - NSSF - safety and basic firearms familiarization session oriented towards the person who has very little to no shooting experience. The First Shots Shooting Experience will consist of classroom and range sessions led by experienced instructors. The Tactical Training Center of NJ and the NSSF will provide all necessary firearms, ammunition and safety equipment. Ultra-Sonic Cleaning Classes Range Time And the best part… the discount card can be accrued to all services! So if you buy 2, 3 or even 4 firearms from us, you can literally save hundreds! Just some of the reasons so many folks come to the TTC gun store for all their firearm needs.